May 26, 2017 0 comments on "Canning Greens"
If your garden is overwhelming you with greens during the summer, here are several ways you can preserve them for winter, including instructions for canning greens. A lot of people freeze their greens (spinach, beet greens, swiss chard, etc. ), but the problem with freezing is that depending on how much freezer space you have, it is easy to run out of freezer space in a hurry! 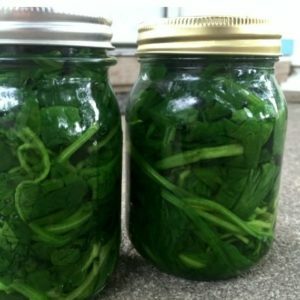 Canning is also a great way to preserve your garden greens. Because greens are a low acid vegetable, you will need a pressure canner to can them, you can’t use a boiling water canner for this recipe. *Note: Two pounds of greens will fill 1 pint jar. Sterilize your canning jars and start heating up the water in your pressure canner. Rinse greens well, removing any bad spots or leaves. Removing stems is optional. Add 1/2 tsp. salt to each sterilized canning jar (optional). Salt is for flavor only. Bring 2-3 inches water to a boil in a large stock pot. Add a handful of greens at a time to the boiling water and boil for 1 minute. Use tongs to remove the greens and place in ice water for 1 minute. Pack greens loosely into sterilized jars. Repeat until jars are filled. Fill jars with hot water, leaving 1 inch head space. Wipe rims of jars with damp paper towel. Place rings and lids on jars. Process jars at 11 pounds pressure for 70 minutes for pints. When canning greens, the pressure canner and jars need to be de-pressurized VERY slowly, or all of the liquid will get “sucked out” of your jars. This happens to varying degrees with different types of foods, but with greens there is more liquid loss. To prevent this from happening, you need to de-pressurize slowly. After turning off the heat and waiting for the lid lock to go down, take the lid off and let some steam escape. Set lid back on pan (without locking it on), and let the pan sit for 10 minutes or so. Take the lid off and let the pan sit for another 10 minutes. Then take the jars out and let them cool completely. Note that the liquid loss may not occur during processing, but while the jars are sitting on the counter cooling, so you may not notice it right away. Any jars that lose too much liquid (i.e., the greens are no longer covered with liquid) should be refrigerated and eaten within a week.